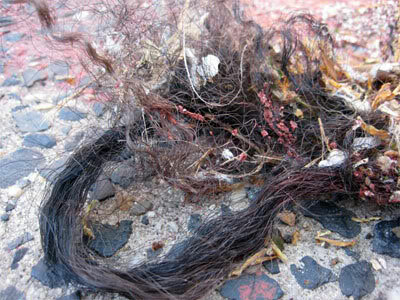 The blog Urban Tumbleweave seeks to further chronicle tumbleweaves discovered in Philadelphia, West Oakland (“the Philly of the West Coast”) and beyond. Each tumbleweave is like a snowflake, representing a particular genus, such as the exotic Synthetica Prolifera. Tumblewave sightings can also be submitted to this excellent Flickr pool. That’ll do, Nadya. That’ll do. As an Oakland resident, I’ve seen many a tumbleweave in it’s natural habitat. These specimen don’t always leave the host on their own, but are often displaced during a physical altercation and left to roll the streets with nothing. 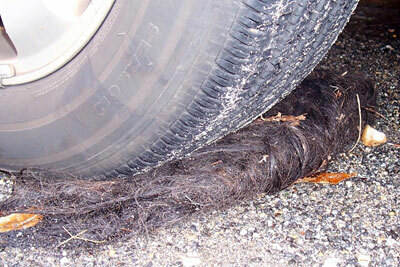 Prime tumbleweave spotting can be had early Sunday mornings outside popular dance clubs. The baked goods that look like heads and body parts don’t gross me out…yet this for unknown reasons turns my stomach a little. So, um, there are people out there who get bits of fake hair attached to their real hair? Is this what I’m to understand? Hmm, I might want to borrow those tumbleweaves for wearing in interesting photo shoots. bleui: Oh my god, I *LOVE* that idea. POST PICTURES!!! That is genius. Giving discarded tumbleweaves a new life! I wish I thought of it first. A bit unhygenic, but TOTALLY briliant. DOOO IT!!! Alice: I KNOW, I was so proud of my former hometown of Philly when I made this pot! Speaking of, did anyone see Good Hair? It sort of passed me by. Must see it ASAP. I saw a sad little one down the block from where I live here in the Midwest. It was an Afrotribble. It was so plain and lonely, I wonder if it wasn’t a REAL piece of hair that somehow got torn out/cut off. It reminded me of the little odd afro in front that my dad had when his male pattern baldness kicked in. If he were a white man, it would have been a little patchy wisp of combover. On daddy, it was a little Afrotribble.